Agriculture in India is greatly concerned by adaptation issues as climate change is predicted to have a significant impact on cultural conditions and consequently on food safety. There has been a call for local measures to adapt to climate change and for the participation of local actors. In this context, we used a foresight study framework to discuss changes in agriculture, land and water with farmers in Sorapet (South India). This article presents: the method applied; the changes in this village within the past 10 years; and the three contradictory scenarios for 2040 as discussed with stakeholders. The foresight exercise produced an interesting setting for the dialogue between farmers and researchers which resulted in focusing on issues such as the attachment to agriculture. Participative foresight alongside local stakeholders, as in this study, is new in India. This experience confirms the usefulness of the attachment approach in promoting alternatives. However, it has to be developed while further questioning its departure from local practices. Agriculture represents the core of the Indian economy and provides food and livelihood activities to much of the Indian population. More than one fifth of the world’s farmers live in India, which has over a billion inhabitants to support and feed. India has succeeded in becoming one of the world's leading food producers, yet at the same time it is still a land of poverty (Landy and Dorin, 2009). In this context, climate change is projected to have a significant impact on agricultural conditions due to raising temperatures, unpredictable rainfall, longer periods of droughts, rising sea levels and extreme weather events. In India, as in many other places in the world, there has been a call for local adaptation. Indeed adaptation to climate change is highly local, and its effectiveness depends on local institutions (Agrawal, 2010). Recent studies have illustrated how participatory foresight approaches can be used to explore possible innovative practices regarding climate change, while also considering radical paradigm changes (Faysse et al., 2014). However, studies have reported challenges and difficulties in involving economic actors and stakeholders in discussions related to the changes that may occur with a certain degree of uncertainty in the long (2030) or very long term (2050 to 2100). The actors involved may not regard climate change as an urgent issue, because they face with many other difficulties such as labor issues or the volatility of markets. This is a real challenge as foresight approaches and participatory processes involving farmers are uncommon in India. Planning is customary in public policies at national and state level, with the Future ‘visions’ of agriculture being clearly defined . Yet foresight studies are not carried out often, reserved for policymakers, and most of these studies focus on technology, industries, etc. In this context, we used a foresight study framework to discuss with farmers the changes in agriculture, land and water in a context of climate changes (Van Klink, 2015). We carried out this work in Sorapet, a village 15 km west of Pondicherry's urban area (South India, Figure 1). The administrative unit of Sorapet covers 435 ha and has a population of 5,110 (Census, 2011). In 2006, this village was selected for an analysis of its capacity to adapt to water scarcity and to understand why watertanks  were no longer used for irrigation (Aubriot, 2013). Over the last 10 years, many changes have occurred under the influence of Pondicherry’s growing urbanization. The next chapter shows the methodology used for this study. Thereafter, we briefly describe the changes that have taken place within the past 10 years regarding land, water and socio-economic aspects. All this information has contributed to envisaging future scenarios. The discussions about these scenarios with local stakeholders is described in a fourth part before the final discussion and conclusion. One challenge in this study was to take land, water and the agricultural system as a whole and to identify the changes in this complex socio-ecological system. We aimed to adopt an integrated approach and therefore used several sources of information to identify changes in land and water uses in Sorapet within the last decade. Our main data came from two sources: first, from surveys carried out in 2006 and 2014. A similar questionnaire was used in 2006 with 50 farmers  and in 2014 to survey 49 farmers, of whom 90% were either the same farmers or family members of the farmers surveyed in 2006. Second, Adangal  data was used to create maps of Sorapet in 2004 and 2012. In addition, eight interviews were conducted and data was gathered from different actors (NGOs, administration, scientists). 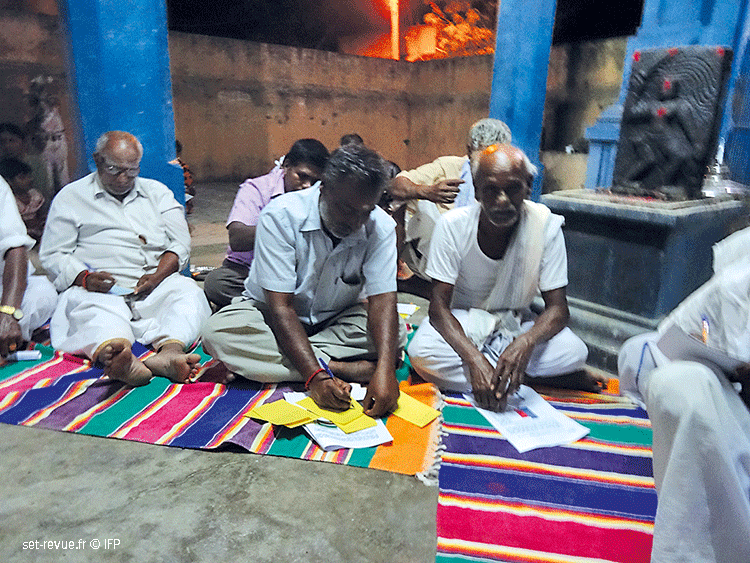 The results were presented to the farmers d taking part in the study during an open meeting in the village temple in March 2015 (Picture 1a and Picture 1b). Over 40 farmers attended including three women. They discussed the results, gave their opinion on major past and future changes and ranked the variables of change. We collected 52 sheets containing opinions in Tamil or English, regarding past and future changes. For example a farmer told us: "In the future nobody will do any farming because it is not valorized and the financial return is too low". The variables identified by the farmers were used to create the storylines for scenarios, combined with future perspective that were taken from literature. Because of the lack of quantitative data, qualitative data was mainly used for the scenarios. The foresight exercise was a novel experience for the participants. The word “future” does not even exist in the Tamil language. In this context, we asked the participants what they wanted for their children and grandchildren and what steps they could take to reach this goal. The timeframe for the scenarios was 2040, because at that time some of the farmers' immediate family members would still be alive and climate change would already have played a role. 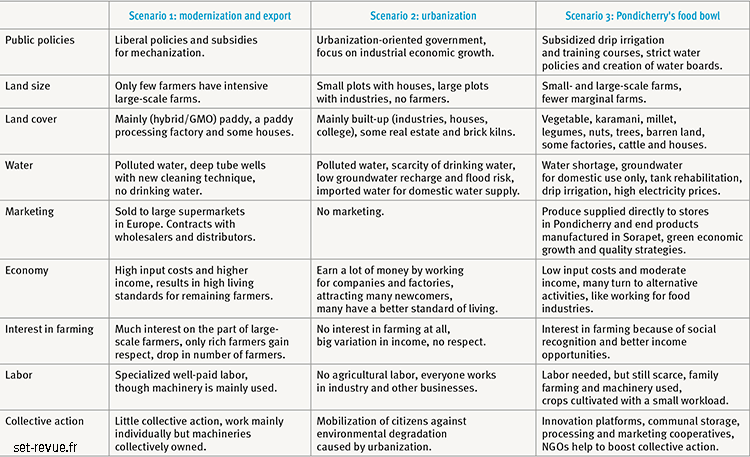 From the scenarios presented, the farmers could prepare their own scenario. The scenarios were discussed in April 2015 (Picture 2) with ten farmers from the Tank Users Association (TUA), a local institution that is liable to support local adaptation to climate change. After the first workshop, the members of this association were interested in going a step further in the process while requesting support to update their strategy. According to the TUA rules in Pondicherry, the TUA board also includes a woman, Scheduled Castes  and landless laborers. Land occupation has changed at a fast pace in Sorapet. The area covered in plots (real estate), brick kilns, casuarinas  and buildings has grown and is expected to continue to grow. Meanwhile, the average size of farmer's land has decreased by 2.1% per year (between 2006 and 2014), fitting the Indian trend. The crops grown in Sorapet have also changed. Paddy, sugarcane and cowpea cultivation has increased significantly while groundnut cover has decreased. The proportion of water-consuming crops is on the rise. Indeed, water is an important issue in Sorapet but of secondary concern today even if climate change and population growth may have significant effects on the quantity and quality of water. Since 2006 almost all farmers own at least one tube well and rely on groundwater for irrigation. Even though drilling new tube wells in Pondicherry has become stricter , we found an increase of 46% in the number of tube wells in Sorapet between 2006 and 2014. What is remarkable in Sorapet is that the groundwater table has risen over the last decade from a depth of 35-40m in 2004 to 25-30m-depth in 2014 thanks to a check dam that had been built across the river. Nowadays, the three main water tanks  in Sorapet are no longer used for irrigation but for other purposes (Picture 3); one tank has been encroached for logging and grazing, while the main tank is used for groundwater recharge, and several small ponds are used for fishing. Besides changes in land and water uses, there have been significant socio-economic changes. Farmers and their wives have changed their secondary activities from agriculture-related activities to small businesses or company laborers. Additionally, almost all the families surveyed had at least one member working in the secondary or tertiary sector. The literacy rate of these families was high with the younger generation mainly being higher educated and less interested in farming. Besides, farm laborers have lost interest in agriculture; they can often get better-paid jobs in urban areas or take part in MGNREGA  programs. According to farmers, mechanization is the main result of the labor scarcity issue. The average income for the farmers surveyed was 2,800 rs/acre/month  in 2014, which is below the national poverty line of Rs 36,000 of annual income. Marketing agricultural products is the main problem today, because of the high variability in selling prices. Crops are mostly sold through "middle-man". Direct marketing is not common in Sorapet. Of the farmers in our study,, more than 50% are members of a farmers’ organization; the farmers classified collective action as one of the major platforms to implement future adaptation strategies. The farmers identified a labor shortage, low income and less interest in farming on the part of the younger generation as the key reasons for the decline in agriculture. Based on previous results, we prepared three contradictory scenarios. An overview of the scenarios is given in Table 1 and the discussion about the scenarios with the Tank Users Association is described in the following paragraphs. Farmers responded positively to this scenario, because they want to continue farming or at least wanted farming to continue in Sorapet. Yet they saw two major problems: the high water requirement and at the same time water pollution by the chemical fertilizers and pesticides. They said that they should save water for this scenario, for example by rerhabilitating the water tanks. One farmer even suggested that it would be better to cultivate organic millet for export instead of conventional paddy. The opinion of the farmers about the probability of this scenario was divided. Some think that this scenario is impossible, because the land has already been converted into houses and factories. 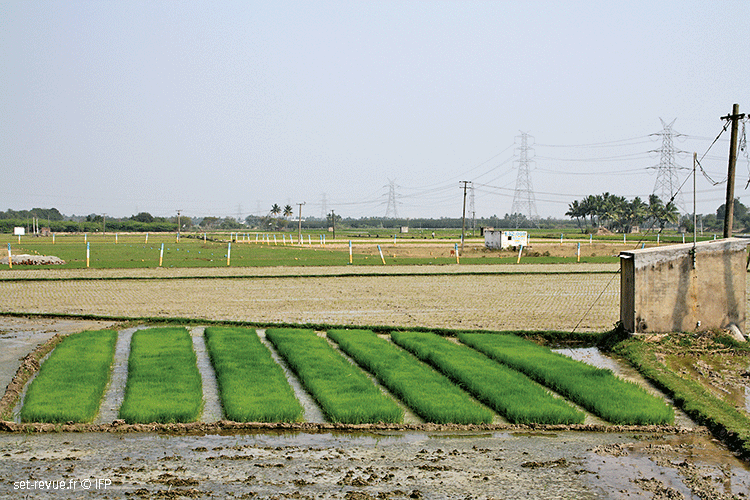 Others say that it is possible because of the high paddy yield and the opportunities for mechanization in Pondicherry. Therefore, this scenario came second in terms of both preference and probability. Farmers said that they would have favoured it more if tank rehabilitation and collective action had been taken into consideration, whereby more farmers could profit from the economic growth. This scenario was less popular with farmers; it scored lowest in terms of both preference and probability. We actually expected the probability of this scenario to be higher, because of the trends observed and the witness accounts collected in the survey and our first workshop. At the second workshop one farmer told us that he had had to sell his land to pay for his daughter's marriage: “there are so many people like me. In that case, they have to move, there is no other choice for them”. Farmers blamed the government for these changes. They expect farming subsidies and regulation of agricultural land conversion and water extraction. They consider that if the government does not give subsidies to small-scale farmers, agricultural land conversions will escalate. Farmers see domestic drinking water, floods and solid waste as the major challenges in this scenario. Some farmers also see advantages in this scenario because of the increase in job opportunities and economic growth. This scenario scored highest in terms of both probability and preference, because it is closest to today’s situation with farming on all plot sizes and crop diversification. Some aspects of this scenario were actually common in the past according to the farmers, for example family farming and collective sales. The farmers see an opportunity in this scenario of increasing their profits by the collective sale of fruits, vegetables and millets, and by fixing their own price. This is also associated with increased recognition of their work. Farmers said that if they have storage space and more knowledge about the selling price, they can increase their income by selling at the right moment instead of giving most of the profits to the intermediary. Furthermore, farmers think that it is important to rehabilitate the tank and to have a water board with elected members. Toward developing foresight approaches in India ? The foresight exercise provided an interesting setting for the dialogue between farmers and researchers. The input from farmers superseded the researchers' forecasts; which resulted in including some variables that had not been thought of at the begining. The farmers insist that agriculture is on the decline, because of a shortage of labor and the loss of interest among the young generation. They are asking for policies to boost awareness and interest in agriculture. Their concern prompts researchers to better understand and document this attachment to agriculture and the new generations' relationship to this activity. In the course of recent decades, agriculture in India has declined and lots of agricultural land has been converted into plots of land to build on. Master plans for most Indian cities are in preparation. Though the focus is mainly on the development of urban areas. Although rural areas are often included in the plans, the government does not have a specific approach. Farmers recognized that land use planning and water management are important for a sustainable future and were ready to take part in collective action if the government did not take any steps. The farmers’ point of view questions the Indian government's general future visions of agriculture that focuses on an increase in productivity thanks to biotechnologies and to the intensification and mechanization. For example, the Tamil Nadu Vision 2023 report (Gvt of Tamil Nadu, 2012) focuses on high-yield crop varieties and intensive farming to satisfy the growing demand for food caused by demographic growth. Farmers call for mechanization which appears to be an important variable for the future and agree with scenario 1. Yet they seemed to prefer scenario 3 slightly more. A foresight approach with local stakeholders as in this study is totally novel in India based both on a participatory process and on the need to consider potential futures to adapt measures. This experience confirms the usefulness of the foresight approach in discussing the current situation and in envisaging alternatives. Working with scenarios can be used to encourage empowerment on a local scale and work towards the holistic management of land and water. It can inspire stakeholders to reflect on how their actions have influence the future while considering that several futures are possible. However, we faced some limitations in the use of this kind of foresight  as some participants do not feel that they have control over their destiny. One of the perspective of this study is to extend the discussion to include over stakeholders in the village and to up-scale the exercise to the Pondicherry region. Discussing scenarios at administrative and local level may lead to interesting debates to improve sustainable planning in context of rapid changes. The participatory process also helped to collect data to document changes as data were missing on past and future trends. One challenge for scientists is the limited amount of data available on regional scale and more specifically, future projections of climate change. More information about these changes could improve the scenarios used and their adaptation. Changes in India are still occurring at a fast pace with the challenge of raising the standard of living for most of the population. For example Government of Tamil Nadu. “Vision Tamil Nadu 2023: Strategic Plan for Infrastructure Development in Tamil Nadu.” Chennai, March 2012. A watertank (or Eri) is a rainwater harvesting system which has multi-functions, the main one being to irrigate crops. According to the census of 2011, there were 102 cultivators in Sorapet that year. Adangal data is the data of the land cover, available at the Village Administration Office (VAO). Official designations given to various groups of historically disadvantaged people in India. Casuarina: a 3-6 year tree crop used for paper or for construction purposes which needs little manpower and water, yet has high investment costs. Since 1997 the aquifers of the Pondicherry hinterland have been classed as ‘over-exploited’. According to the Easement Act of 1882, water use is connected to land ownership and land owners are free to extract and use water as they like. In keeping with the Pondicherry Groundwater Act 2002, well owners have to register their wells and the government can refuse permission for new wells.Although the government is strict concerning new wells, old wells can be deepened and open wells can be converted into tube wells. Water tanks used to collect enough rainwater to irrigate the crops, but since the introduction of modern tube wells during the Green Revolution in the 1970s, tanks are less used and maintained (Aubriot, 2013). NREGA (National Rural Employment Guarantee Act) guarantees 100 days of work per year for every rural household that is willing to do unskilled labor. 85 euros/ha/month (1 acre = 0,4ha). Compared to those of astrologers. van KLINK, Isabel ; RICHARD-FERROUDJI, Audrey ; VENKATASUBRAMANIAN, G. ; AUBRIOT, Olivia ; PRABHAKAR, Ignatius, From climate change to changes in agriculture, land and water at village level: a foresight approach in India, Revue Science Eaux & Territoires, article hors-série, 7 p., 13/03/2017, disponible en ligne sur <URL : http://www.set-revue.fr/climate-change-changes-agriculture-land-and-water-village-level-foresight-approach-india> (consulté le 22/04/2019), DOI : 10.14758/SET-REVUE.2017.HS.03. 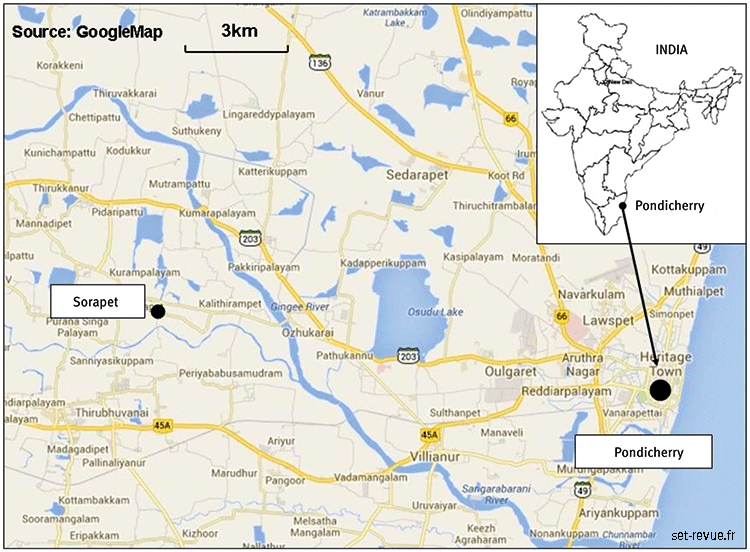 Map situation of Sorapet, 15 km west of Pondicherry urban area and the imprint of tanks in South India. Workshop, March 2015: participants writing their opinions about past and future changes. 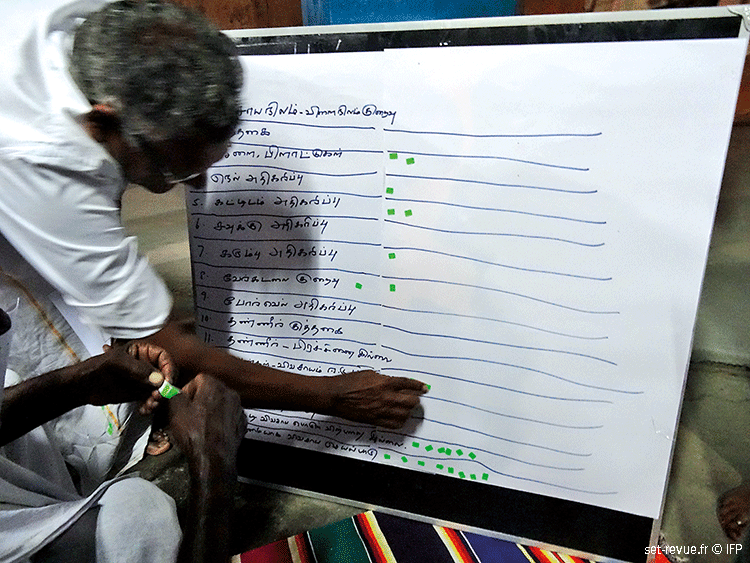 Workshop, March 2015: Farmer using green stickers to identify main variables of change. 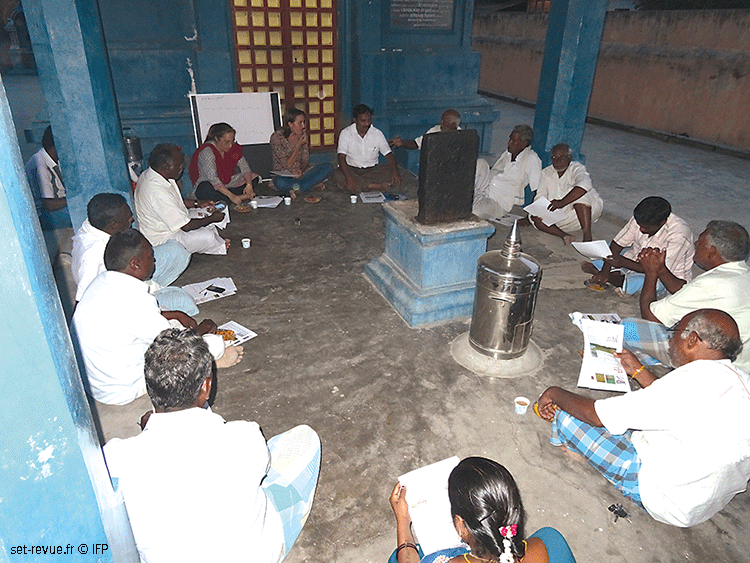 April 2015: Foresight meeting with Tank Users Association in the village temple. Paddy nursery, a shed for the groundwater pump on the right and land plotting for real estate in the background, Sorapet, February 2014, close to the main tank which is no longer used for irrigation. AUBRIOT, O., 2013, Tank and well irrigation crisis: spatial, environmental and social issues. Cases in Puducherry and Villupuram districts (South India), Concept, Delhi, 334 p.
FAYSSE, N., RINAUDO, J.D., BENTO, S., RICHARD-FERROUDJI, A., ERRAHJ, M., VARANDA, M., IMACHE, A., DIONNET, M., ROLLIN, D., GARIN, P., et al., 2014, Participatory analysis for adaptation to climate change in Mediterranean agricultural systems: possible choices in process design, Regional Environmental Change 2014, n° 14, p. 57-70. VAN KLINK, I., 2015, Past and future land and water uses in Sorapet (2004-2040), Thesis submitted in partial fulfilment of the degree of Master of Science in Ecology and Environmental Science at Pondicherry University, India., 60 p.
LANDY, F., DORIN, B., 2009, Food and agriculture in India. From Independence to globalization, Manohar-CSH-Quae, New Delhi, 280 p.
11 saint Louis Street, Pondicherry 605001, Inde. 7 rue Guy Môquet, 94800 Villejuif Cedex. 15/A First Floor, Institutional Area, Sector-IV, R.K. Puram New Delhi-110022, Inde.